In Spotlight, we have conversations with artists, designers, producers and makers in Dundee to explore some of their projects and ideas. This week we catch up with Lucy Caster, Laura Collins, Rhia Cook and Annabelle Gurney – the ambassadors for Fashion Revolution Week at the University of Dundee who are also in their third year of Textiles at DJCAD. Sam Gonçalves: Can you guys tell me a little more about the Fashion Revolution Week? Lucy: It runs from the 24th to the 30th of April. The 24th of April is the anniversary of the Rana Plaza collapse in Bangladesh, where 1138 people were killed and thousands more injured. It was the largest ever garment factory collapse. That set off the Fashion Revolution organisation, the original founders just thought that something needed to change. They use the week to campaign and raise awareness, mostly through events, and they get people in universities who want to be involved and hold the events. It’s really just to try and get as many people knowing what’s the problem and then just trying to get further transparency in the supply chains. Annabelle: It’s not about money, it’s about raising awareness. Also, this year, we’re hosting a swap shop at the university. We collect-in clothes from people and they get points based on how much they have donated. Then, on one day we hang all the clothes up and you come with your points to exchange them. Laura: We just try to get people to donate garments that they like but don’t wear and someone else might like them. You can revitalise your wardrobe without spending any money. Rhia: Or creating more waste. SG: So, was watching these films what motivated you to get involved with the campaign? Annabelle: Definitely. You have no idea how much energy and resources it takes just to make one t-shirt. There are all these people working on the most important parts of making the garment real, and they are the ones suffering. Rhia: And then the t-shirt itself will be sold for a fiver. I think because everything is so cheap and there are so many cheap options for people to buy, you think that less goes into them, you don’t even think about the process behind it. It’s about getting people to realise that although it’s cheap, there’s a cost to that cheapness. SG: There’s also a cost to you guys, studying textiles and hoping to go for careers in the industry, when you set yourself an ethical standard to ask questions and work with specific materials. How does this campaign factor in to your own work and plans for the future? Lucy: I definitely think of that all the time now. We had a project that was about designing for a circular economy. So, that kind of sustainable thinking in a closed system. We can’t be lazy designers, there’s a real problem and we have to address it. Annabelle: And the game is changing, and it has to change. If not, we’re going to have to be the ones to make it change. Whenever I’m designing something, I have to think about the ethical implications and the true cost of it. Laura: We can’t change every aspect but if you focus in on one element of the circular economy and work on that, you will make a difference in some way. Specially if people who feel this way decide to collaborate. SG: How can other people help? What’s your practical advice? Lucy: Educate yourself. Think about what you’re buying. I guess just be considered and ask the brands where your clothes came from. Rhia: I think, as well, you can’t fix everything. It’s not necessarily not buying clothes from any retailer ever again. It is about baby steps and slowly incorporating small changes. Small changes on the way people think and act add up to big things. Annabelle: Shedding some light on the problem, raising awareness, is something people can do. Lucy: And it’s actually an exciting thing to think about the journey of your clothes. Where they came from and who made it. We’re not saying that there shouldn’t be any fashion brands, it’s just that it needs to be traced back, it needs to be transparent. As long as we can see its journey we can hold that process to account and it has to pass legal standards. Fashion Revolution Week at Dundee University will be hosting a film screening of ‘Slowing Down Fast Fashion‘, a documentary exploring ethics in the fashion industry, on Tuesday April 25th at 7pm in the Dalhousie Building. 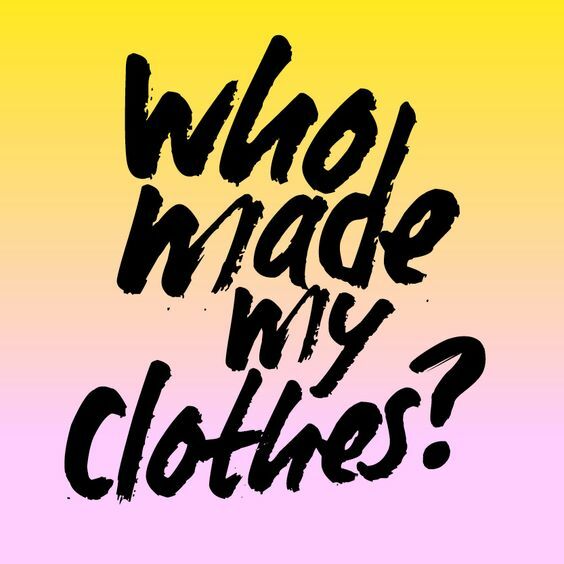 For more on the ethics of fashion, the Rana Plaza collapse and how we can respond, you can watch Kristina Johansen-Seznec‘s Pecha Kucha talk, below.